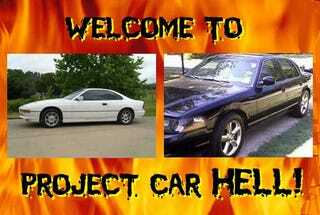 PCH, Financiapocalypse Moonshine Runner Edition: Mercury Marauder or BMW 850i? Welcome to Project Car Hell, where you choose your eternity by selecting the project that's the coolest... and the most hellish! With the Dow taking it in the shorts today, we're all thinking about how we'll keep afloat during the hard times that seem to be looming, if not already here. Naturally, federal, state, and local governments are thinking the same thing, and that means they're going to jack up the taxes on booze! Which, as students of Southern United States history know, that means opportunity for enterprising gearheads willing to assist the makers of fine lead-and-glycol-enhanced alcoholic beverages in getting their products to thirsty, unemployment-maddened consumers who won't have the wheelbarrows full of hyperinflated cash necessary to pay the revenoors' bite. Yes, you'll need to convert a big, fast car into a white-liquor-haulin' moonshine runner! You know that cash-strapped police departments aren't going to have any money to replace their old Crown Vics with faster machinery once the Financiapocalypse really gets rolling, and budget money for helicopters? Forget it! In order to catch moonshine runners, they're going to have to do so at speeds of 130 MPH or less, which means a powerful, sophisticated German car should be able to stay safely ahead of John Law. Remember, though, that you need something big enough for substantial tanks of "whiskey" or "vodka" or whatever label the cartel wants to slap on their bottles, and the suspension must be able to cope with the added weight of all that highly flammable fluid sloshing around. That's why you need the might of a V12 and the heft of an 8 Series chassis, but how to get one without spending too much of your stash of gold ingots? Hey, bust out $5,750 of your soon-to-be-toilet-paper fiat currency, before The Fed gets all the printing presses rolling at full tilt, because this 1991 BMW 850i- conveniently located in moonshine-friendly Tennessee- is ready to go! It's "a serious car that needs just a little attention," so you figure a few turns of the wrench, the addition of a stainless steel (or rusty steel, to add healthy iron and nice "aged in oak" coloring) tank, and you'll be rollin' like Bob Mitchum! You really think the revenoors ain't gonna upgrade their fleets with confiscated cars the minute chaos envelops the cities and the bread lines turn into something out of the Battle Of Hue? Brother, you know John Law is going to be 200 MPH-capable when that day comes; those that aren't running down moonshiners in ZR1s and R8s are going to be stuffing supercharged 5.4 engines in their Police Interceptors, and then where will your fancy-schmancy BMW be? We can't say what will happen to your car when they catch you, but you'll be sucking down lead fumes in the Tough On Crime Penitentiary™ Battery Recycling Plant, and you don't want that. That's why what you need is stealth- a car that blends right in, yet still has the speed to make the occasional high-speed dash to the finish line. Say, something like this 2003 Mercury Marauder, which is essentially a warmed-up Crown Victoria Police Interceptor and can be had, in this case, for just $5,500. Don't worry about the seller's statement "MADE A MECHANICAL REPAIR TO THE VEHICLE AND THE OWNER DITCHED IT," because the post-Financiapocalypse world will be full of easy and cheap ways to get totally realistic-looking registration documents. Of course, you'll need to do something about the engine, but F150 Lightning drivetrains ought to be getting pretty cheap by now. There's room aplenty for the requisite white-liquor tank, and a suspension built to withstand endless impacts with curbs and speed bumps should be able to take the pounding administered by logging roads and potholed post-collapse city streets better than anything out of Bavaria!